The 2018 Golden Globe Awards were unlike any awards show we’ve ever seen before. And we hope they’ll set a precedent for all future shows. As part of the Time’s Up initiative to end systemic sexual harassment, nearly every star on the red carpet wore black in protest. E! News reporters, instead of asking the stars who they were wearing, instead asked why each star was in black. And powerful conversations arose, continuing throughout the night. 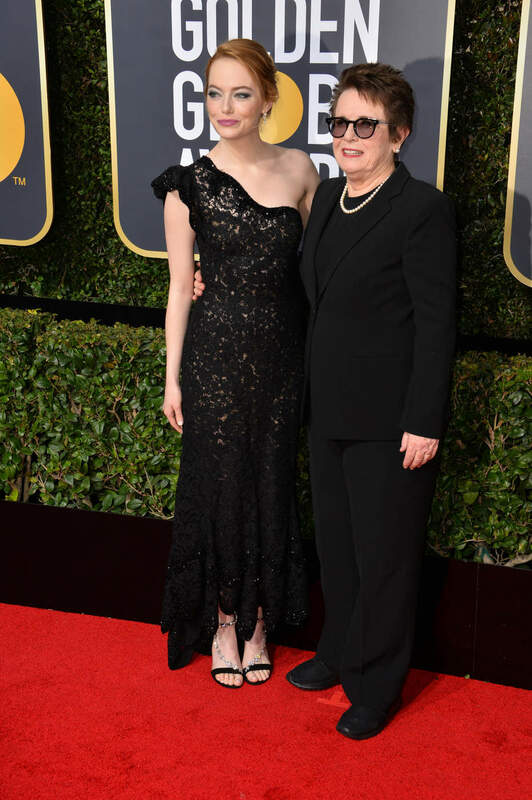 Numerous news outlets vowed to cover fashion differently at the Globes in light of this movement, and we’re all for the change. After all, everyone who wore black last night deserves to be commended for it. Fashion is part of the conversation, but it’s far from the most important part. Again, fashion was at the forefront of the night, but for a different reason than usual. In celebration of fabulous fashion and the fabulous women who joined Times Up’s initiative, here are our fashion favorites from last night’s awards show. Game of Thrones star Emilia Clarke stunned in a minimalist deep-v strapless gown by Miu Miu. Emilia kept her look classic, accessorizing with a major diamond necklace and a red lip. She also wore Jimmy Choo sandals. Kendall Jenner surprised fans when she hit the red carpet at the Golden Globes. Though Kendall isn’t an actress and it was unclear why she was attending the Globes, we were psyched to see her there. Girl can certainly rock a red carpet! Kendall gave off major Angelina Jolie-leg vibes in this dramatic strapless Giambattista Valli gown, accessorized with killer Christian Louboutin heels. 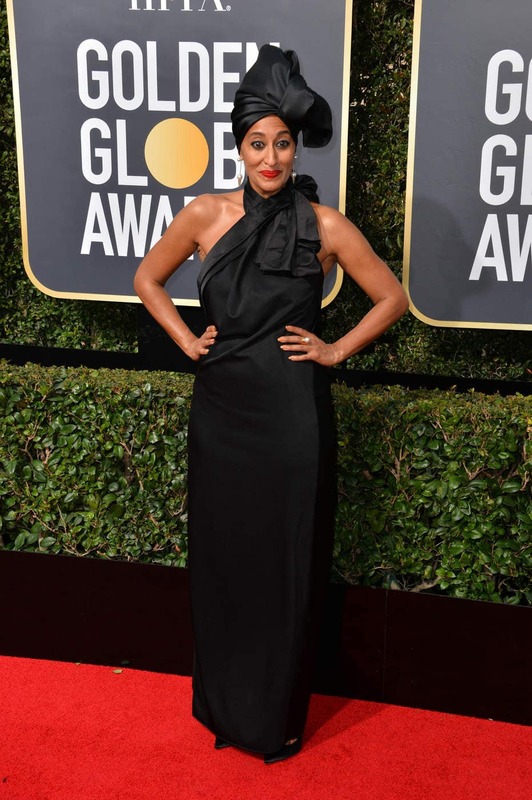 Tracee Ellis Ross showed off her trademark quirky style at the Globes, rocking a Marc Jacobs gown with matching head wrap. It’s what Tracee had to say about her look that really impressed us, though. Emma Stone stunned with her date Billie Jean King at last night’s ceremony. Rocking a sculpted lace one-shoulder Louis Vuitton gown and a chic updo, Emma looked every bit the established leading lady. Emma’s look was also noteworthy for its incorporated unique details, from embellished sandals to purple and green makeup in reference to the suffragette movement. This attention to detail brought her ensemble over the top. Forever a fashion princess, Kerry Washington was true to form last night in shimmering sequined Prabal Gurung. She added extra style with a tousled wave hairdo and some major statement earrings. Kerry, never one for bland and boring, finished her look with a final cool-girl touch, adding embellished Roger Vivier ankle booties. Dakota Johnson looked fantastic while wearing the “it” designer of 2017 and 2018, Gucci. In a vintage-inspired gown featuring an embellished belt and major back detailing, Dakota looked like a goth princess on the red carpet. True to Gucci’s “more is more” vibe, Dakota didn’t skimp on accessories, adding long statement earrings and a few sparkling bracelets to her look. Alicia Vikander went for a surprising choice last night, donning a Victorian-inspired gown by designer Louis Vuitton. Featuring a high neck, shimmering embellishments, and semi-sheer layers, Alicia’s gown was complex and intriguing. On anyone else, this might not have worked, but on fashionista Alicia, this dress was perfection. She styled it well, adding just sleek, pulled-back hair and stud earrings. Zoe Kravitz brought all the attention to her face in a simple strapless Saint Laurent gown, accented with major emerald earrings and a bold red lip. The cut of the dress was perfectly tailored to Zoe, showing off her cool tattoos up and down her arms. I mean, what can I even say about this? It has a CAPE, y’all. Diane Kruger, forever a daring fashionista, killed the red carpet in an over-the-top sheer embellished Prada crisscross neck gown with attached sheer cape. She accessorized with badass extras like a metal box clutch and edgy-cool earrings. Stunning! Insecure showrunner and star Issa Rae is everyone’s favorite person right now and she was our favorite fashionista of the night. Issa turned heads in a shiny black deep-v gown by Prabal Gurung, featuring a major leg slit and shoulder detailing. Experimenting further with her ensemble, Issa added a major emerald lariat necklace as the centerpiece of her look. Slay, Issa, slay! Did you enjoy watching the broadcast as much as we did? Are you in support of the Time’s Up movement? Which star had your favorite all-black look? Let’s talk in the comments!